Planning a girl’s getaway can be difficult especially when trying to come to an agreement on the best destination. Whether it’s shopping sprees or relaxing with spa day treatments, identifying a perfect location is critical before hitting the open road. After much discussion, we all agreed that our chosen location required a beach, good shopping, fun attractions and of course great food! I soon realized that the choice was not difficult at all and the question had been answered in record time – Gulf Shores and Orange Beach in Alabama. Having visited this stretch of coastline previously with my husband, I knew that taking my girls here was the perfect choice. All we have to do now is plan our itinerary in an area that has endless possibilities. During my last visit to Gulf Shores and Orange Beach, we stayed at The Beach Club by Spectrum Resorts and had an amazing experience there. We researched various other alternatives in the area but many of the resorts just didn’t compare to Spectrum Resorts high quality accommodation. A word of caution if you are planning a getaway for early May. Book early because this is the start of the peak season and this is a much sought after destination and you certainly don’t want to settle for something if it is not at the beach. However, the fall is also an ideal time to visit the area. The beaches are spacious and uncrowded and the lodging rates can’t be beat! Spectrum Resorts has the ‘best of the best’ along the Gulf of Mexico so when we stumbled across another property of theirs I didn’t think twice. Turquoise Place is a luxurious resort that is located in the heart of Orange Beach. All the best amenities like a gas grill and your own private Jacuzzi are included, in addition to their Clean Bed Guarantee that is revolutionizing the market. Have you ever wondered how frequently hotels and resorts actually wash your bed linens? Sometimes comforters may only be washed twice each year. However thanks to Spectrum Resorts, “Each guest bed will be made with a freshly washed duvet and linens prior to your arrival.” Turquoise Place here we come! When you make a trip to the beach of course there will be morning runs, gorgeous sunrises and sunsets and that amazing beach smell with the waves crashing while we are relaxing. What do you do when you venture away from the beach? We are hoping to save time for a little retail therapy in the nearby Tanger Outlet mall in Foley, as well as the local markets and boardwalks within the area. There is something to be said for being one with the water and we are excited to have booked a sunset cruise with Sail Wild Hearts. The cruise will last around 1.5 to 2 hours on a 53-foot catamaran. Tickets are $35 to cruise around while we sooth our souls and embrace the moments with the ocean. The Waves of Wine Festival took place during our visit in May, featuring live music, food from a variety of local restaurants as well as craft beer and of course over 120 different wine selections to try. Tickets were $35 and that includes a cruise around the bay during the event for you to enjoy the breathtaking scenery in the Gulf. An added incentive is the inclusion of a wine glass and bag to help cherish your memories from this experience. The festival is at a Caribe The Resort, which is in close proximity to Turquoise Place. However, for fall trips, there are several other foodie festivals that tick all the boxes for a fun girl’s getaway, including The Wharf Uncorked Wine & Culinary Event, Annual National Shrimp Festival, World Food Championships, Oyster Cook Off & Craft Beer Weekend at The Hangout and the Frank Brown International Songwriters’ Festival. Even if your trip dates don’t coincide with one of these, you’ll still find plenty to do (or not do) during your girl’s getaway to Gulf Shores and Orange Beach. Gulf Shores and Orange Beach is spoiled for choice when it comes to fine restaurants and cuisine options. Seafood here is delicious and the hardest part is choosing which of the many establishments to sample. One restaurant that I am really excited about trying is The Gulf, which is located directly on the beach. Serving food inspired by the Gulf of Mexico, this outdoor venue is just a really cool looking restaurant. Did you know The Gulf is made out of re-purposed shipping containers? This beach bar has much to offer in terms of atmosphere and of course food selection, from burgers to tacos this place looks like it has it all and dinner is going to be amazing. 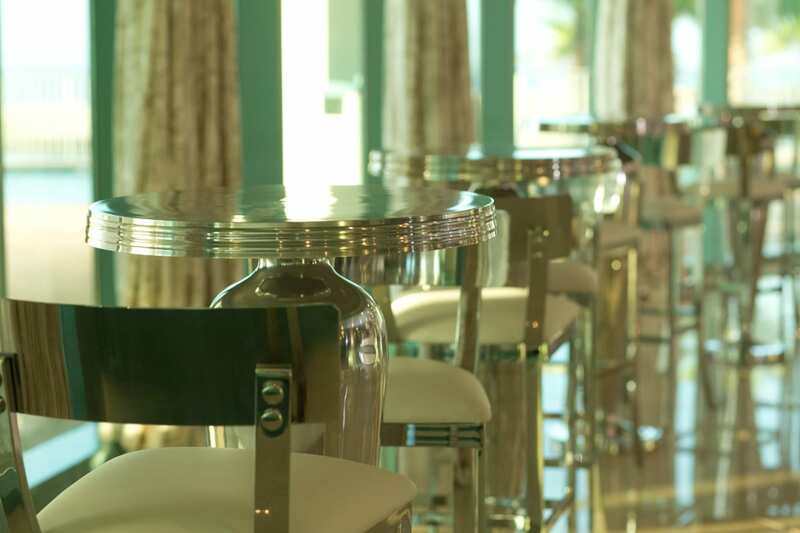 Of course, we have to mention Coast Restaurant & Sushi Bar at The Beach Club. The panoramic views of the beach, great wine selection and menu choices are out of this world! Make reservations by calling (251) 224-3600. Now that you know where to stay, relax and dine, it’s time to start planning your next girlfriend getaway at The Beach Club.